At the time, the storm's unusual severity was attributed to the ongoing civil war in Syria by media outlets in the Middle East, Europe and the United States. Reports blamed the conflict for changes in land use and cover—and for activities like increased military traffic over unpaved surfaces and farmers reducing irrigation or abandoning agricultural land—that created extreme amounts of dust to fuel the storm. Now, a team of researchers including Elie Bou-Zeid an associate professor of civil and environmental engineering at Princeton who experienced the storm while in Lebanon, have found a more likely cause for the unprecedented storm—it was not human conflict, but a combination of climatic factors and unusual weather. While reduced vegetation cover and soil disturbance can make more sediment available for emission in dust storms, the researchers say, the widely reported link between the storm and the fighting in Syria was untested and lacked empirical support. "The reports suggesting that this was related to the conflict in Syria were not supported by any research," Bou-Zeid said. "It was just hypotheticals thrown into the air." As the storm got more attention, Shmuel Assouline of Israel's Agricultural Research Organization and Bou-Zeid emailed several colleagues and suggested they look into the cause of the storm. For their study, published Nov. 8, 2016, in Environmental Research Letters, the researchers first analyzed vegetation cover data for the months leading up to the storm to see if the Syrian conflict had really changed the land cover that much. "These observations told us that the normalized difference vegetation index (NDVI)—which is kind of a measure of how 'green' the surface is, how much vegetation there is—was not abnormally low," Bou-Zeid said. "So, there was nothing to suggest that during this particular period there was less greenery or agriculture in the region than normal." In fact, the storm-struck region's vegetation cover was nearly twice as high last year than the 2007-2010 average, and also greater than the 2001-2007 average. After gathering data on surface air temperature, humidity and wind speed, and running meteorological simulations for the region before, during and after the storm using the Weather Research and Forecasting (WRF) model, the researchers say that climate, not conflict, led to the conditions that made the storm possible. "The simulations showed that what was very unique about this storm is that first, it was preceded by a very hot period, and so the land that was not covered with vegetation would be drier and it would be easier to entrain sand grains from it," Bou-Zeid said. Summer 2015 was unusually hot and dry relative to the last 20 years, and extreme high temperatures and low humidity were more frequent in August and September than during the region's long-term drought, which lasted from 2007 to 2010, Bou-Zeid said. The extremely arid conditions increased the amount of dust available and lowered its threshold for erosion, making it more likely that the dust would dislodge into the atmosphere. The other factor that helped generate the storm, the researchers say, was an unusual wind pattern. "Usually these dust storms are created somewhere between Syria and Iraq and are transported south, but during this period the wind pattern was going east to west," Bou-Zeid said. The wind reversal added friction on the ground—which dislodges more dust—and transported it westward over long distances before depositing it in high concentrations on the densely populated east Mediterranean coast. The storm ultimately enveloped major parts of Syria, Lebanon, Turkey, Israel, Egypt, Jordan and the Palestinian territories. Bou-Zeid said it was important to answer the question of the storm's origins directly. "If the cause of the storm was human conflict, then when the conflict ends, the causes go away, and that's all good," he said. "But if the cause was not conflict and is more climate, and this is due to climatic conditions that are going to become more frequent in the future, then this is something that will reoccur." 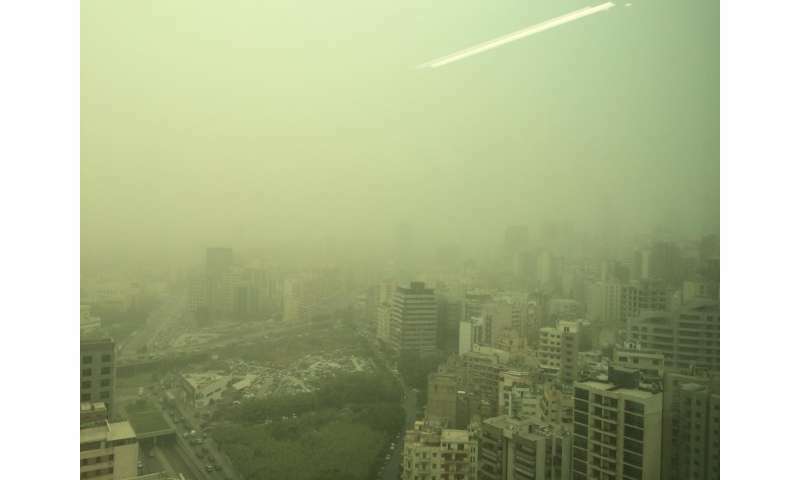 The team warns that if the Middle East becomes more arid in the long term due to climate change, extreme dust storms may become more common, and their impact unavoidable. 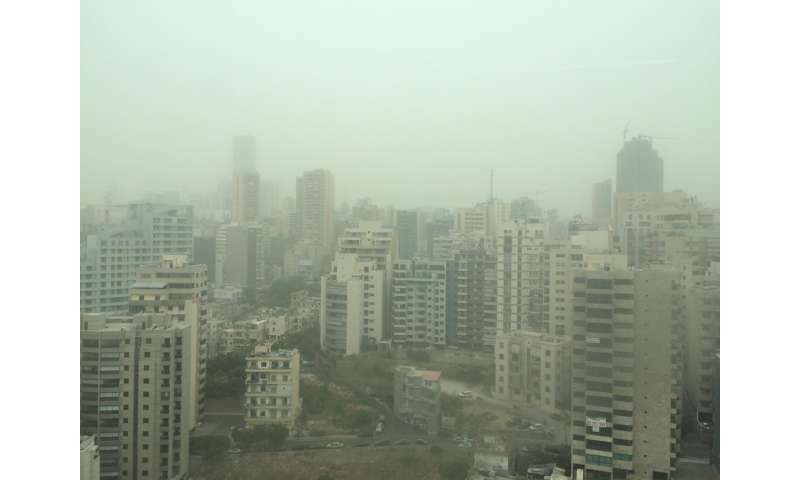 Bou-Zeid and Assouline's co-authors on the paper, "Climate, not conflict, explains extreme Middle East dust storm," were Anthony Parolari from Marquette University, Dan Li from Boston University and Gabriel Katul from Duke University. It happened because a butterfly flapped its wings in Botswana. What if somebody was to create an alternative simulation which showed that humans had nothing to do with it at all? Are they proposing that this cannot be done? No, but still the current most rational belief given the current most up to date evidence is that it is improbable, NOT impossible, that there would be future proof that it wasn't man made. And they and nobody here is CLAIMING it is logically impossible that it may be proven to be not man made some time in the future. Get it now? Or was that just your moronic straw man against science? possible but, in this case, very unlikely I think. The real question is what effect the dust storm had on the conflict. Global Warming.... is there any disaster it isn't responsible for? More FAKE "science" from a desperate AGW Cult as the day of reckoning fast approaches. I wonder how many of these hypocrites will drink the Special Kool Aid. Nobody is claiming global warming is responsible for all disasters. No such cult exists; just good science. Not only Nobody is claiming global warming is responsible for all disasters (as I said before) but this link doesn't explicitly blame those dust storms on global warming but merely on "climate" and merely just part of the cause at that. Although it did very clearly imply climate played a part, it didn't even mention "warming" and it said "While reduced vegetation cover and soil disturbance can make more sediment available for emission in dust storms " thus they clearly were not putting the whole blame on climate, let alone specifically global warming. You should read a link before criticizing it. It most certainly wasn't made by monkey gorilacle's socks posting on the first three comments above. The Middle East has been having dust storms for a long time. Trying to say it's caused by something other than natural forces is seeking grant money for research on climate change. Why not blame it on changes in the universe? It's been changing for billions of years and hasn't stopped. The Middle East has been having dust storms for a long time. By a "long time" do you mean over millions of years? If so,nobody is CLAIMING man caused dust storms millions of years ago. Trying to say it's caused by something other than natural forces is seeking grant money for research on climate change. So are you saying because for billions of years, before man even existed, climate change has always had natural causes, man couldn't cause climate change now man exists in great numbers? Summer conditions are alway hot and dry in that part of the world. There is no rain for the entire summer season. I have memories of it from more than 40 years ago and visits off and on over the decades. It is so predictable that many car owners remove their windshield wipers to keep them from dry rotting in the sun. In addition, dust storms are not unheard of in Israel. It is from desert winds that blow through the region. So unless there is something particularly notable about this weather, I'd say it is climate as usual. Now if someone were complaining about the Winter being this way, I'd sit up and take notice. ab3a is right. These hot dry dust storms are a common feature of the Middle East and Northern Africa. They have a name for it: khamsin. And the 3% man made CO2 is the cause, that's 0.0012 of the total 0.04 percent CO2. Do they pay you to post babble and talk to your own socks on sunday evenings too or are you just so much of a close minded goon ? Thumbsucking a percentage or quoting one from a pseudoscience or fossil fuel backed one only adds to your delusional hypocrisy. The scientific evidence on this question is overwhelming. The "cult" is the denier cult, unmistakably identifiable by their rejection of science. Empirical evidence that humans are causing global warming??? The Cult is unmistakably identifiable by the ignorant Chicken Littles who are incapable of an independent thought so they troll the internet parroting their cult's dogma as it is fed to them. Tell us Chicken Littles, how much man made CO2 was responsible for the dust bowl of the 1930s? Independent thought is all nice and dandy. But when it flies in the face of evidence then it's just stupidity you are praising, here. Uh huh, evidence like that german pdf you posted. If that does not confirm what idiots you Chicken Littles are, then nothing ever will. As for praising stupidity, look at the responses you Chicken tards give 5s too. 3. Have used evidence in their presentation that contradicts the empirical climate evidence. Well, that's a serious study by serious scientists taking into account all available data. All you have to counter it is "Nuh uh - I don't believe it". Guess which one holds more weight? Just being contrarian isn't smart. Smart is if you take each issue and evaluate the evidence as impartially as you can. Sometimes this will mean that you agree with the majority and sometimes this will mean that you won't. But being contrarian just for the sake of being contrarian is the most stupid attitude possible. As I said, posting that german pdf that no one could read was "brilliant". i.e. beyond contrarian. Now try and answer this question. How much man made CO2 was responsible for the dust bowl of the 1930s? "Do they pay you to post babble and talk to your own socks on sunday evenings too " No need for pay. He talks to his socks for free because they never interrupt him. Sure, they disappear at inconvenient times, but they never tell him he's wrong or ask inconvenient questions. Would any of you Chicken Littles please answer. Well large areas of the region were desertified as a result of chronic overpopulation. And the region has always been embroiled in conflict. Environmental ruin and endemic conflict are symptoms with a common cause. Would any of you Chicken Littles please tell us what your "science" says about the following. did your eyes skew over the monitor or are you pressing buttons without looking ?